Just picked up a 2003 Superhawk from the Dealership I work for. Got it for $500 and it has been sitting in our inventory for 3 years. It has just over 10,000 miles on it. It has a cracked oil pan so I picked up a used one for $35 that I'll be putting on. The bike has been down a couple times so I'll be repairing and refinishing the fairings. (I was a collision tech before I became a service writer.) The engine covers are scratched so I'll pull them off and have them powder coated. Figured I could try to make the bike a little more modern looking. Needless to say, the carbs need cleaned and rebuilt. Figured while they are off I'll jet them for the Yosh slip ons. Anything else I should do while the carbs are out of the way? 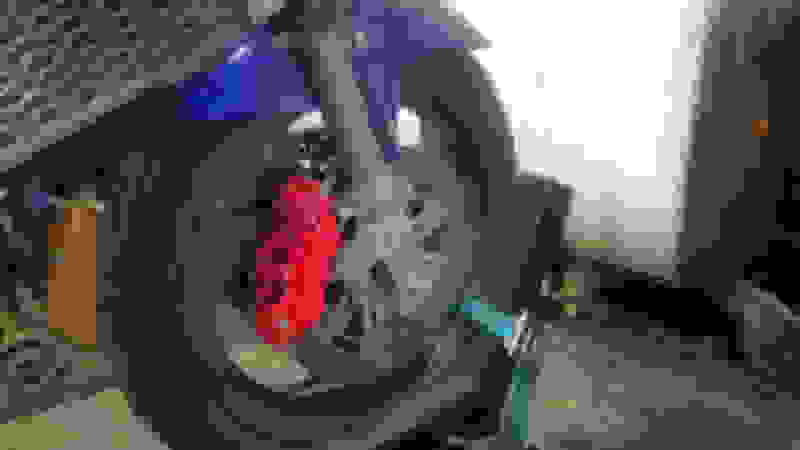 Air box mods, breather mods, coolant mods etc. Links would be very much appreciated. Thank you for the very helpful info. Once other question? Can I delete the carb heaters? Rather not have one extra thing to leak and I live on the central coast if California so cold isn't really a problem. A few people have deleted the carb heater lines without issues. Living in FL I was going to delete mine next time my carbs come off. Where ya from? I know of several people who have deleted the carb heaters, most recently someone in the New England region of the US. He has had no ill effects after. Welcome to the Forum. Although our beloved Super Hawk has been out of production for 14 years, there are still a few active and knowledgeable members/fans. I've gleaned numerous sources and solutions on everything from Jetting (Hawk8541), R&R replacement (E. Marquez), Lightened flywheels(E. Marquez), Suspension (Jaimie Daugherty), Various parts (Captaincaos) ad infinitum. Many of the opinions, and supporting facts, differ, as do our bikes and needs. Over the years I've found what works best for me. Utilizing "Search", you can too. Central coast like the SLO area? The carb heater lines I believe are needed to address only a very small and complex condition range that most bikes will never experience. After lots of discussion, observations and experience with others as well as some talks with a friend that is an expert in carb icing conditions and ways it is dealt with for aircraft ... I believe the majority can delete the carb lines and never notice a significant difference (carb icing and run-ability issues) Though I also believe many in colder climates riders will get better run ability after starting but before the motor is fully warmed up with coolant lines connected to the carbs. With just a little attention to some new O rings, upgraded silicone hose and appropriate silicone hose clamps, you can leave them connected and not see leakages issues for 10's of years. Just south of SLO in Santa Maria. Maybe we'll have to meet up sometime and share "Hawk" tales. When it comes to the clutch is it worth running an Oberon salve cylinder or is the stock one fine once it is rebuilt? Well heavy Bias here...as I have an Oberon. One day I was using a working clean OEM slave with fluid less than 4 months old, later that evening I was using the Oberon and it felt different, travel about the same but smoother engagement and a better feel. Its not in the top 50 things Id upgrade or MOD on a VTR, but its not snake oil bling either. I decided that I'll rebuild the clutch slave cylinder since I'm going to be flipping the bike. I am going to have it powder coated while it's apart to add a little bling. It's going out with my valve covers and brake calipers to get coated red. Also I picked up a set a gsxr1000 front calipers for it. With the carbs off consider thumb fuel screws. Saved my bacon for sure since removing them to adjust is very time consuming. Carb heaters are pointless. I ride year round in NYC and had mine disabled for years even in 0*F. No difference in running or starting. I think it was a Honda committee that put them on. My understanding of it is that carburetor icing is not a temperature problem, but rather a relative humidity or dew point problem and more likely happen in humid & warm weather. Already took care of them and went ahead and got the choke pieces to since I know they are prone to breaking. Im in the pan handle of FL. Next time I have to take mine off im taking that hose off also. I doubt it will make a difference. Floyd don't just take them off since they are flowing coolant you will have a mess. Just in case you were just going to do that. No they are going to be capped properly. Capped or a bypass hose, both have 2 leak points so no advantage there. If choose between just those two options I suggest is a bypass hose...as its easier to get high quality 8mm silicone hose and quality silicone hose clamps then it is silicone caps designed to cap coolant ports. Rubber caps do not last, they get old and age crack in short order. Or if your sure you want to get rid of the coolant hoses, seal both ports permanently with plugs and silver solder, Thats what I did on my 98, reducing possible failure points by 2, never a bad thing. On my 2001 I decided to replace all the coolant lines, o rings, ect and have a fully working system that will outlast my ownership of the bike. Another question, since I've got the bike apart, should I install a factory pro shift kit? Is it a worthwhile upgrade? YES worthwhile MOD, as is the shifter assembly from DMr ..though I think I bought his last new one some months back. If he is no longer making them you can still mod the stock with with spherical rod ends.. DO NOT GET Teflon lined rod ends, they are too stiff... you need quality 3 piece non lined and then keep then cleaned and lubed. I was considering running a set of the Dan Moto rearsets. Do some searches and find the posts about addressing the rear brake lever issues found after installing. Thanks for that advice, perhaps I'll just replace the ends on the linkage. Do it on the cheap and have the peg mounts powder coated to clean them up. The fairing/headlight stay is bent in on the left side of the bike. It's not much but it's enough that the fairing won't fit correctly once I repair it. Can anyone tell me the distance between the left and right? Maybe the distance between the left and the gauges? Something I can use to bend it back into place. Thanks. Best suggestion is, don't worry about measurements...tweak it to fit.... they tend to bend the "leg" on the side the bike went over on..but impacts to the front, even say sliding on its side into a curb, tree, car or another bike is enough from what Ive seen to bend the stay in multiple directions / parts. So I work at a Honda dealership. My cost on the fairing stay is $177.29 and there are 5 left in the Honda warehouses. How long would it take you to make up a jig if I was nice enough to purchase one and send it to you on loan? Lol. Think we could work out some kind of deal? No idea..and ya, my cost quoted today when I went to see my parts guy was $168 (I work though a dealer network, the managing company owns more then 200 dealerships across the US, pretty much every name brand but KTM, they get insane pricing as due to the volume they order as a network for all the brands they cover...and since I do my own parts look up and supply part numbers I get actual cost plus just a bit, and they make a few bucks on the part, plus all the sales and service leads I can send them) ... The job is doable but I just don't have the time till after the new year. Got some parts back from powder coat yesterday. Thought I'd share this pic.